Avery Institute originated in the Saxton School, which was founded by Francis L. Cardoza in 1865 as a school for African American students. Cardoza’s request to the American Missionary Association for a secondary school resulted in the purchase of a Bull Street lot and construction of this three-story brick building c. 1868. 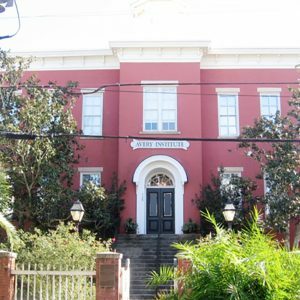 By 1880, Avery Institute had almost 500 students, including many of South Carolina’s most prominent African American leaders, taught by an integrated staff including Charlestonians and northerners. Today the building houses the College of Charleston’s Avery Research Center for African American History and Culture, archives, research center, and museum. (JANUARY 2018): The Avery Research Center is closed to the public. No on-site tours or archival access will be provided at this time.